Chances are that you’ve gone through a self-checkout line in a store at some point. You scan each of your items, bag them, and pay without the assistance of a cashier. A pretty straightforward concept, right? As it turns out, self-checkout lines were just the first step in what has become a major technology-based revolution in the way that shoppers pay in brick-and-mortar retail environments. But self-checkout is just one evolution in the payment process. There’s no shortage of new tech solutions working to make the retail experience as painless as possible. It’s no wonder retailers are attempting to innovate the checkout process — customers consistently report that making a purchase is the most painful part of the shopping experience. Although more than two-thirds of people still prefer to shop in-store, more than 70% of surveyed consumers said the checkout experience is their biggest pain point. Long lines and lengthy wait times at checkout are major reasons that some customers have turned to online shopping. But some brands are taking a crack at making the checkout process less painful. From self-checkout kiosks to mobile point-of-sale systems to getting rid of checkout altogether, these retailers are hustling to keep customers happy and encourage more sales in-store. Even in its traditional form, the checkout line as we know it has been dying for some time. The widespread use of contactless pay has been slowly eating away at customer wait times since its introduction in the late aughts. And while there’s a slower uptake of contactless chip cards in the U.S., one Guardian article estimates that contactless card use now accounts for 1 in 5 purchases in the U.K. Mobile payment is another option on the rise. It uses near field communication (NFC) or Bluetooth technology to allow customers to pay — as the name implies — using their mobile phones. Apple, Android, and Samsung all have their own versions of mobile pay. And while these mobile wallets have been slow to hit critical mass in the U.S., they’re gaining popularity worldwide. Services like Scandit also enable small business owners to look into mobile pay options without the intense time and dollar investment of creating their own app. To further decrease time spent in traditional checkout lines, many retailers are going paperless. And one of the primary ways retailers are eliminating paper is to email receipts to customers rather than offering a paper copy at checkout. Not only does this save time (no waiting for receipts to print), but it also makes it easier to pull up returns and track purchases for customers over time. The paperless system also has the added benefit of reducing the time that shop owners spend on paperwork and eliminates any budget spent on paper for receipt rolls. With the proliferation of mobile-based point-of-sale systems like Shopify POS, it’s now possible to arm every retail employee with the power to check out customers anywhere in your store. Mobile software can transform smartphones and tablets into a POS, which means there’s no need for a stationary checkout area. Not only does this system disperse lineups by stationing mobile POS systems throughout your store, but it also helps employees offer a more informed customer experience. With information about product specs and current stock at their fingertips, employees are better equipped to answer any customer questions at checkout time. And without the added burden of a long line of impatient customers, staff can take the time to thoughtfully talk customers through their purchases. Apple is perhaps the company best known for using this approach. Staff is equipped with an iPad and check on orders for customers, book them appointments at the Genius Bar, view the status of items under repair, and take payment for purchases. They can also bring up each customer’s entire purchase history. So, instead of the customer waiting in multiple lines around the store or seeking out different staff to find an item or check on their appointment status, the dispersed POS approach allows one staff member to take customers through their entire retail journey. As a happy side effect, they’re also avoiding the frantic energy associated with long lineups concentrated in one area of the store. So far, we’ve looked at some modern takes on the traditional checkout counter, but what if the checkout line wasn’t even an option? That’s exactly what some companies are starting to experiment with. Several retailers are pioneering this approach using a variety of technology. Removing the traditional checkout experience could be a game changer for both retailers and their customers. And here are a few key examples of tools retailers are using to revolutionize checkout. In 2014 alone retailer apps saw an increase in the use of 174%, according to a report from Flurry, Yahoo’s mobile analytics firm. While creating your own retail app might be too large an investment for smaller retailers, large retail chains like Starbucks and Walmart are seeing major success. These apps combine features of in-store navigation (where applicable), ease of purchase, a decrease in waiting times, and customer loyalty rewards all in one app. Walmart also recently announced a pilot whereby customers are able to ring in items via the company’s app while they shop. So, by the time they’re done putting everything in their cart, all they have to do is press “pay” and head home with their merchandise. Think that creating an app might be right for your brand? Check out these 5 Shopify merchants that made their “app-spirations” a reality. Restaurants have their own technology that cuts down on customer wait times. 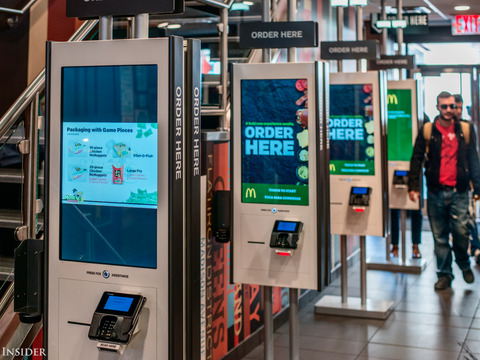 Fast food vendors like McDonald’s give their customer the option of ordering the old-fashioned way or through large self-serve, touch screen kiosks located near their traditional checkout lines. But smaller restaurants that don’t have the capacity to install their own touch screen system can still find ways to integrate customer-controlled tech into their ordering process. Services like MenuPad offer restaurants a way to streamline their ordering and payment process without taking away the human touch that diners have come to expect. Staff is still there to greet customers, answer questions, and bring food out from the kitchen; but tablets at each table allow customers to enter their orders and payments themselves. Restaurants that cater to the corporate lunchtime and takeout crowds can also make use of services like Ritual which allow customers to order from the office and come by to grab their lunch once it’s ready. When employees are crunched for time on their lunch breaks, anything that cuts down on wait times is going to give a lunch spot an edge over its competitors. After all, lunch breaks are finite and the quicker customers can start eating their meal, the happier they’ll be. Apps like Ritual move the customer-facing checkout process to the third-party app — which can be faster for both retailers and customers alike, especially during lunch and dinner rushes. One trend that’s merging the brick-and-mortar experience with the convenience of online shopping is “showrooming.” Essentially, customers come to a store to check out merchandise and get a feel for it offline, and then place an order for it online. While this is a trend that’s worried some physical retailers, showrooming can benefit both customers and brands. It’s the perfect blend of the online and offline shopping worlds. Warby Parker is a great example of a major brand that brought its online product into the offline world with a showroom model. While the brand began selling glasses entirely online, eventually it made sense to open brick-and-mortar locations in selected cities to offer customers the chance to try on frames in person. At these retail locations, customers touch, feel, and try frames then order their glasses through Warby Parker’s website either with the assistance of a staff member or on their own. This showrooming model helps retailers that can’t afford to rent out a huge space to accommodate a full store’s worth of inventory. This way, they can show off their goods in a small space, take full advantage of foot traffic, and still garner the sales benefits of a full-sized brick-and-mortar retail operation. And showrooming allows customers to have an immersive shopping experience and have products shipped straight to their doorstep. While some of the most tech-heavy options might not be right for every merchant, there are simple ways retailers can incorporate tech solutions to jump on the revolution to kill the checkout line. Implementing contactless payments, going paperless, and floating POS systems are great starting points for any business. Have you changed the checkout experience in your store? Share what’s worked for you in the comments below.